The light of sunrise is warm and wonderful and an added benefit for landscapes like this one of Swift Current Lake in Glacier National Park the wind hasn’t yet started blowing for the day and reflections can add immense interest into a scene. 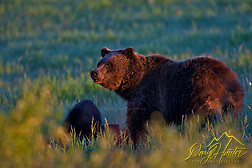 Grizzly Bear Morning sun, The sun had just popped over the mountain and lit Grizzly #610 up like a Christmas Tree. Direct sunlight a half hour later wouldn’t have enabled this light. From the inception of photography, it has been about capturing light. The word “photography” comes from the ancient Greeks and means, “to write with light” A true photographer is a master of light. Light is the energy that is recorded by your camera and the essence of all photography. When viewing your photos what you’re actually seeing is the nature of the light reflected off your chosen subject than in turn captured by you with your camera. You are capturing the reflected light off the subject, not the subject itself. Light to a scientist is that very small portion of the electromagnetic spectrum that normally stimulates sight. Light to a photographer or an artist is more emotive they speak of light in terms like hard and soft, warm, and cool. But, the light we see and what the camera records on film are not quite the same thing. The question is how do we learn to understand light, use it to make better pictures? How do command it? 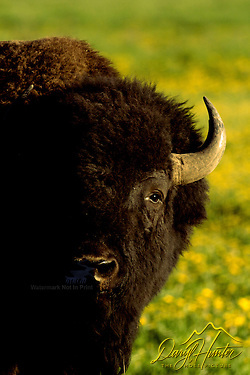 Bison, Grand Teton National Park. I used the direct hard light of the morning sun for huge contrast and exposure latitude difference my DSLR couldn’t capture to interesting effect. There are three elements that a photographer must understand when taking pictures: light, composition and subject, however without light you have neither subject nor composition. Once a photographer understands they are not photographing a subject but are instead capturing light is when they have control over the medium. 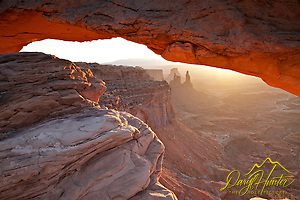 The most important light source for the landscape photographer is the ambient light from the sun. Natural sunlight is constantly in flux from the warm light of the morning, to the boring light of midday to the spectacular warm colors of evening. Throughout the day, natural light provides us with unlimited nuances of intensity and color. Existing light photography, sometimes called available or natural light photography is the making of pictures by the existing light that happens to be reflected to the camera from the scene. Existing light is the purview up the landscape and wildlife photographer. To be successful you must learn to own it. There are four basic properties, or conditions, of natural light: hardness, softness, contrast, and color. The color, direction, quantity, and quality of the light determine how your subjects reveal themselves to our lense. Light dynamics changes with the weather, season, location, latitude, and hourly with the movement of the sun, every change greatly affects the appearance of a scene. These are not simple concepts, but they’re essential to an understanding they dynamics of light. Hard Light • Direct sunlight creates hard light that generates deep crisp shadows, unflattering at midday but very pleasant earlier and later in the day. The quality of hard light depends on its strength and direction. Our eyes rely on shadows to recognize shapes, but for photography we prefer a subtle shadow because of the limitations of the latitude of our image censors of our DSLRs. The direction from which hard light comes will often determine the success of a photo. Morning, afternoon, and evening sun come to the subject as side lighting, when side light comes from the front or rear of a subject is generally better than top lighting which comes from above. 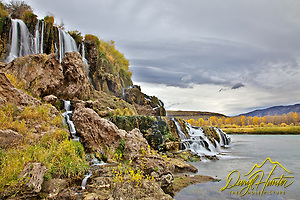 Fall Creek Falls, Swan Valley Idaho. An overcast day (diffused light) makes no shadows, there is also less light which is advantageous for waterfall photography. Color • Photographers speak of the color and temperature of light; color temperature is a characteristic of visible light that has important implications for photographic lighting. Color temperature is conventionally stated in the unit of absolute temperature, “the kelvin” the kelvin has the unit symbol K. Color temperatures below 5,000 K are the warmer colors and are yellowish white through red, color temperatures over 5,000 K are the cooler colors that lean bluish white. An understanding of color temperature is important at both the time of exposure and during post processing of photos. Oddly enough though to warm up a photo you move the temperature slider to the + 5000 K region, the farther you go, the warmer the photo and vice a versa to cool the photo. Evidently the slider effectively moves the center of warm and cold in the direction in which it is adjusted. Counter intuitive, imagine that! 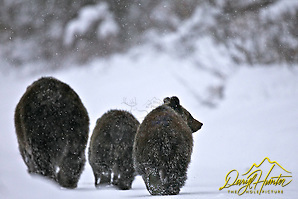 Grizzly sow 399 and two cubs in snowstorm. This was just before the lights got turned out, ISOs were dialed in above the comfort range because of low light because it was snowing right before sundown. The resulting photo file was unpleasantly cold so I cranked up the color temperature in post processing and saved the photo. Contrast • Definition of contrast: “the state of being strikingly different from something else, typically something in juxtaposition or close association. To set in opposition in order to show or emphasize differences – the brightness range of a scene and the difference between highest and lowest luminance.” As stated in the hard light/soft light explanation directional light; for example, the sun creates high contrast lighting with hard shadows; diffuse light or a large light source gives low-contrast lighting with soft shadows. Colors opposite each other on the color wheel are regarded as contrasting for example, blue and yellow, green, and red; colors of adjacent hues do not contrast as strongly. The capture of sweet light remains our goal. A photographer’s magic is the ability to stir the soul with light and shape and color. The road to better photography begins with an understanding of the nature of light. Photographic light can be fleeting, and has been the cause of much anxiety, disappoint and jubilation for all nature photographers. We search endlessly for the moment when the natural world is bathed in that golden light. Rarely are we rewarded to our satisfaction but the journey is good. Posted on Tuesday, March 27th, 2012 at 1:52 pm. Filed under: Photography, Photograpy Tags: ambient light, diffused light, explained, hard light, how to, landscape, light, light source, lighting, natural light, nature, photography, soft light, why, wildlife	RSS 2.0 feed. Peter, good catch and thanks for that, I switched it up with an explanation. Oddly enough though to warm up a photo you move the temperature slider to the + 5000 K region, the farther you go, the warmer the photo and vice a versa to cool the photo. Evidently the slider effectively moves the center of warm and cold in the direction in which it is adjusted. Counter intuitive, imagine that! When I was researching it didn’t register as it is opposite of of the action we do to correct. Beautifully written article—and one that is so very accurate! Light makes (truly) ALL the difference between a documentation shot and a dramatic one. I loved your analogy of landscape shot being one in which you’re attempting to capture the personality within the scene. Well done! Your photography is truly STUNNING!